Rehab-Care specializes in equipment for the nursing and health sectors. We develop and manufacture standard and customized equipment such as hospital beds, treatment tables, bed tables and toilet- and shower chairs as well as lifts and other types of lifting equipment for the nursing sector. Our products are used in every Danish hospital as well as a wide range of municipalities and clinics. A considerable amount of products are delivered to other European countries such as The Netherlands, Germany, Norway and Sweden. 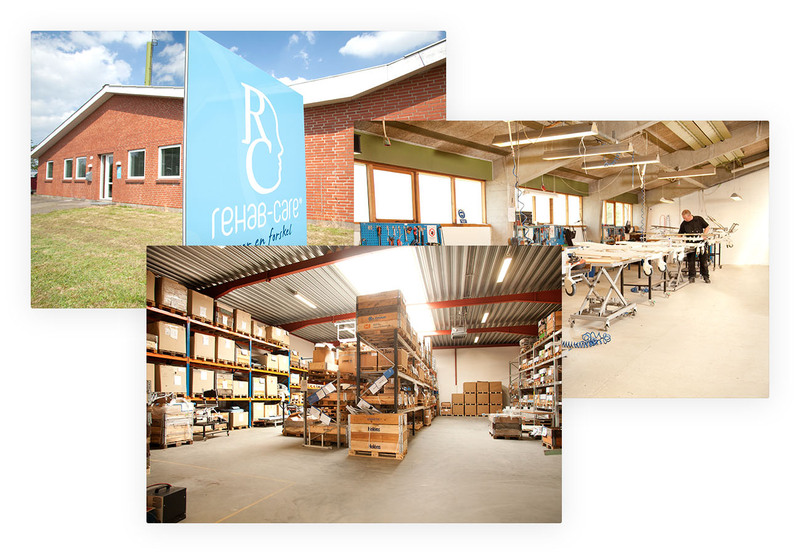 We have more than 20 years’ experience in manufacture, repair and servicing of quality equipment from our factory in Herning. The daily life in the health sector needs to be problem-free. At Rehab-Care, we are aware of that fact, and we therefore monitor the development in the nursing and health sectors carefully in order to stay up to date on the most recent trends and equipment requirements. We develop products in close co-operation with our clients. This close co-operation enables us to consider the safety and comfort of both patients and healthcare staff as well as the functionality and ease of operation of the equipment. We test all our prototypes in co-operation with the Danish Technological Institute and external consultants. We also follow the rules governing the manufacture of Class 1 medical equipment very closely.